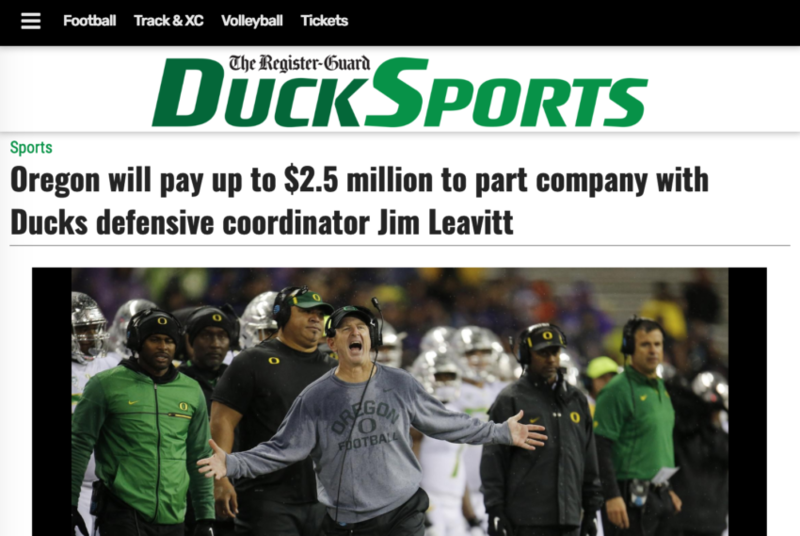 UO Matters – Page 3 – Open to everyone with an opinion about the U of Oregon and a web browser, since 2007. Open to everyone with an opinion about the U of Oregon and a web browser, since 2007. … Authorities said the crimes date back to 2011, and the defendants used “bribery and other forms of fraud to facilitate their children’s admission” to numerous college and universities,” including Georgetown, Yale University, Stanford University, the University of Texas, the University of Southern California and UCLA, among others. One of the cooperating witnesses, according to the court documents, is a former head coach of Yale’s women’s soccer team, who pleaded guilty in the case nearly a year ago and has since been helping FBI agents gather evidence. Some of the 32 defendants are accused of bribing college entrance exam administrators to facilitate cheating on tests — by having a smarter student take the test, providing students with answers to exams or correcting their answers after they had completed the exams, according to the criminal complaint filed in federal court. The ideological bent of those overseeing collegiate life is having the biggest impact on campus culture. I received a disconcerting email this year from a senior staff member in the Office of Diversity and Campus Engagement at Sarah Lawrence College, where I teach. The email was soliciting ideas from the Sarah Lawrence community for a conference, open to all of us, titled “Our Liberation Summit.” The conference would touch on such progressive topics as liberation spaces on campus, Black Lives Matter and justice for women as well as for lesbian, gay, bisexual, transgender, queer, intersex, asexual and allied people. As a conservative-leaning professor who has long promoted a diversity of viewpoints among my (very liberal) faculty colleagues and in my classes, I was taken aback by the college’s sponsorship of such a politically lopsided event. The email also piqued my interest in what sorts of other nonacademic events were being organized by the school’s administrative staff members. I soon learned that the Office of Student Affairs, which oversees a wide array of issues including student diversity and residence life, was organizing many overtly progressive events — programs with names like “Stay Healthy, Stay Woke,” “Microaggressions” and “Understanding White Privilege” — without offering any programming that offered a meaningful ideological alternative. These events were conducted outside the classroom, in the students’ social and recreational spaces. The problem is not limited to my college. While considerable focus has been placed in recent decades on the impact of the ideological bent of college professors, when it comes to collegiate life — living in dorms, participating in extracurricular organizations — the ever growing ranks of administrators have the biggest influence on students and campus life across the country. 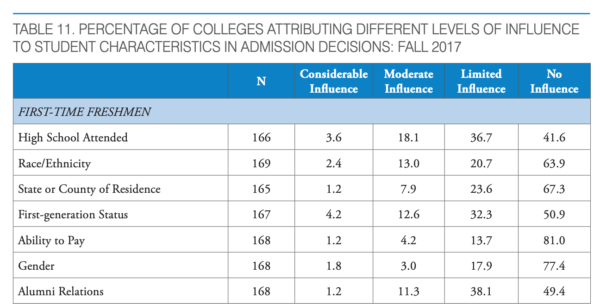 … Intrigued by this phenomenon, I recently surveyed a nationally representative sample of roughly 900 “student-facing” administrators — those whose work concerns the quality and character of a student’s experience on campus. I found that liberal staff members outnumber their conservative counterparts by the astonishing ratio of 12-to-one. Only 6 percent of campus administrators identified as conservative to some degree, while 71 percent classified themselves as liberal or very liberal. It’s no wonder so much of the nonacademic programming on college campuses is politically one-sided. The 12-to-one ratio of liberal to conservative college administrators makes them the most left-leaning group on campus. In previous research, I found that academic faculty report a six-to-one ratio of liberal to conservative professors. Incoming first-year students, by contrast, reported less than a two-to-one ratio of liberals to conservatives, according to a 2016 finding by the Higher Education Research Institute. It appears that a fairly liberal student body is being taught by a very liberal professoriate — and socialized by an incredibly liberal group of administrators. 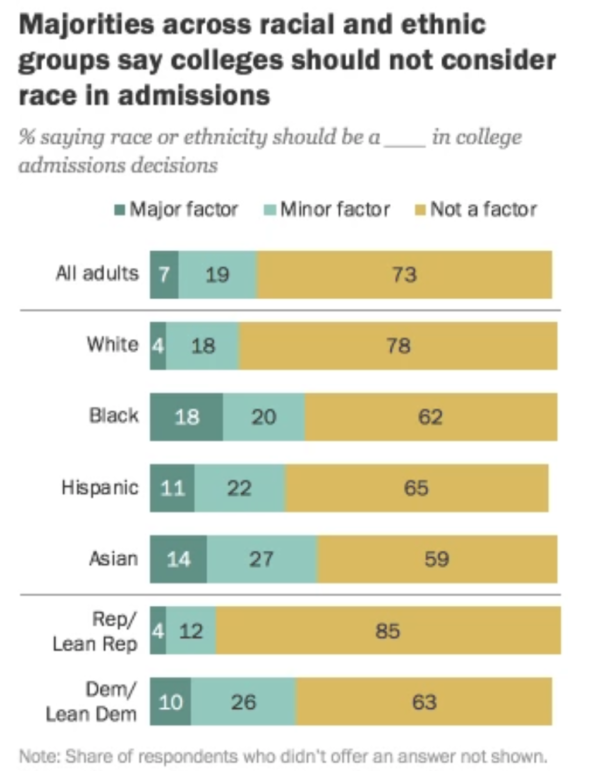 … This warped ideological distribution among college administrators should give our students and their families pause. To students who are in their first semester at school, I urge you not to accept unthinkingly what your campus administrators are telling you. Their ideological imbalance, coupled with their agenda-setting power, threatens the free and open exchange of ideas, which is precisely what we need to protect in higher education in these politically polarized times. 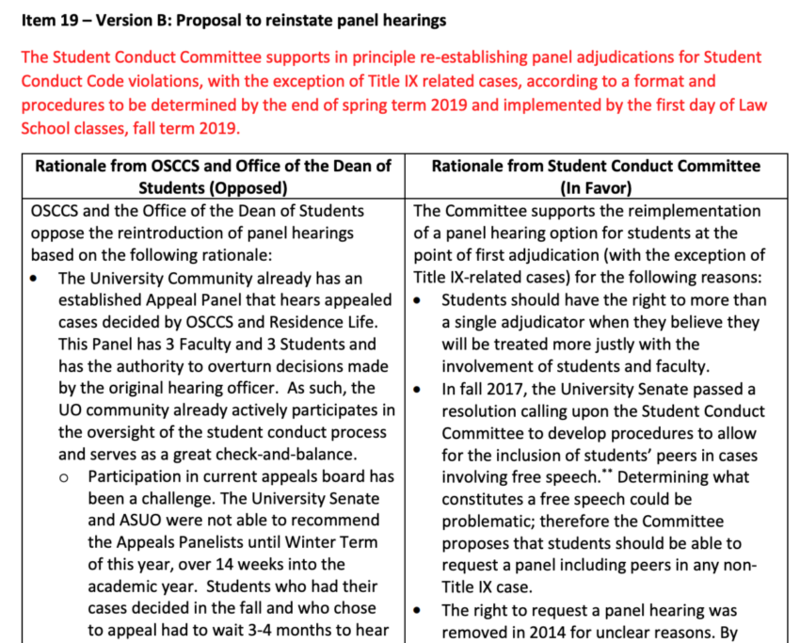 But hey, maybe the OLCC will do a better job protecting free speech than UO’s General Counsel Kevin Reed. Thanks to an anonymous reader for the tip. and the decline in unionization rates is responsible for twice as much of the increase in inequality as previously believed. Declining real minimum wages also have had a larger effect on increased inequality than found in previous studies with older data. That’s the takeaway from the first 30 minutes of today’s UO Economics seminar by Thomas Lemieux, 3:30-5:00 in 111 Lillis. This is the way Econ talks work – first they tell you the results, then they spend the rest of their 90 minutes explaining and defending the data and the empirical model they used to estimate them. ABSTRACT: This paper extends the DiNardo, Fortin, and Lemieux (1996) study of the links between labor market institutions and wage inequality in the United States and updates the analysis to the 1979 to 2017 period. 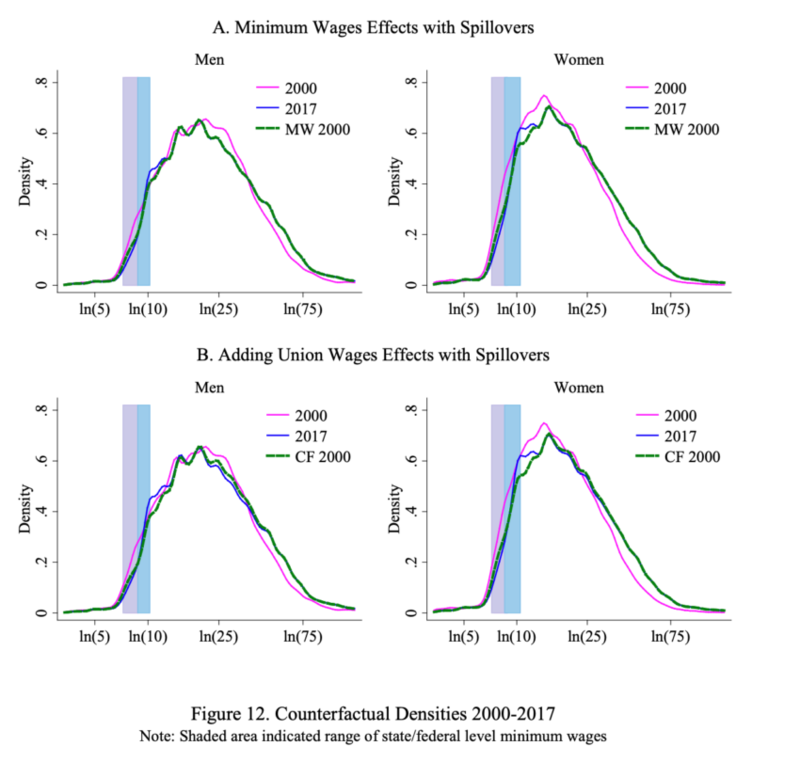 A notable extension quantifies the magnitude and shape of spillover effects from minimum wages and unions, providing multiple sources of evidence for the latter. A distribution regression framework is used to estimate both types of spillover effects separately and jointly. Accounting for spillover effects doubles the contribution of de-unionization to the increase in male wage inequality, and raises the explanatory power of declining minimum wages to two thirds of the increase in inequality at the bottom end of the female wage distribution. That would be former President Dave Frohnmayer, in April 2009. The previous year Frohnmayer had negotiated a $150K raise for himself, and at the time of this public meeting he was negotiating a golden parachute retirement contract that included a paid sabbatical which he used to restart his legal career at the Harrang, Long, Gary and Rudnick law firm. 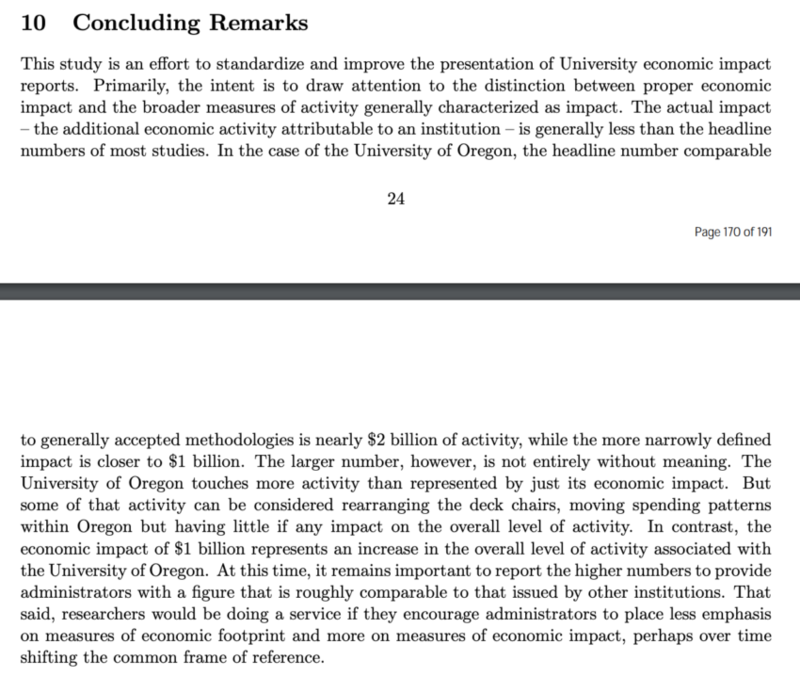 Highlights include former Interim Provost Jim Bean lying about how UO’s administrative costs were 38% of our peers, and the news that given the crisis the athletic department would contribute $100K to help the library buy books. Rob Mullens soon put an end to that. Pres Schill on Addressing Budget Challenges – What should we cut? 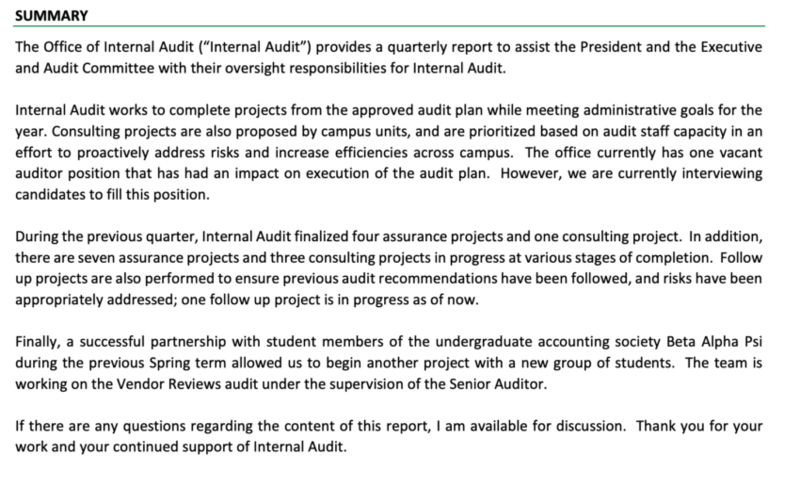 Over the last few months, we have communicated with a wide variety of campus stakeholders to let them know that the University of Oregon is going into a difficult budget cycle. 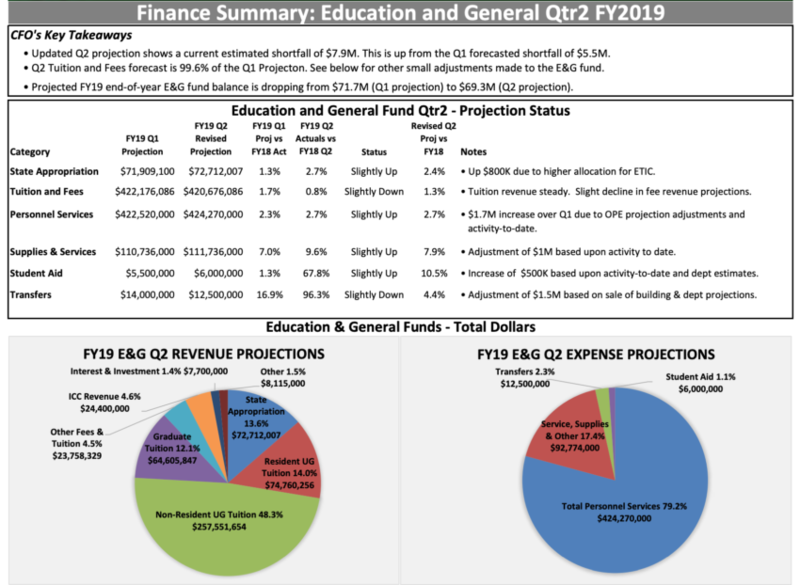 Vice President for Finance and Administration Jamie Moffitt has given many presentations articulating the increasing expenses that are putting pressure on our FY 2019–20 budget. We have been clear that without additional state support—a requested $120 million for all of Oregon’s public universities—we will be unable to hold resident undergraduate tuition increases at or below 5 percent and would likely be forced to look at budget cuts. While I hope that the legislature will provide public universities in the state with the funds we requested, it is now evident that, even if the state does fulfill the request, we will need to reduce expenditures over the next two years. In addition to rising costs attributable to personnel, PERS, and health care, we are experiencing the full impact of a substantial reduction in international student enrollment. The UO enrolled large classes of students from abroad as recently as the 2015–16 academic year. Since that time, however, like many other American universities, the numbers have begun to fall off. Over the last three years, international enrollment has dropped by almost 1,000 students, representing more than $32 million in recurring tuition revenue. This decline should stabilize over the next few years as revenues slowly increase from our domestic enrollment growth initiatives. As a result, unfortunately, we will need to reduce annual operating costs by between $10 and $11 million. While some of these reductions can be implemented immediately, some will take more than one year. Vice President Moffitt, Provost Jayanth Banavar, and I will spend the coming weeks seeking additional advice and input from campus stakeholders about how to manage this situation without eroding the tremendous progress we have made in many areas across campus over the past few years. We also want, as much as is possible, to protect programs and services that are vital to our core academic and research mission. It is my intention to come back to all of you in less than a month with a more detailed plan about how we will move forward. Given that almost 80 percent of the UO’s general-education budget comprises salaries, the reality is that any cost-reduction efforts will affect jobs and people. I recognize that this news will cause anxiety among many in our campus community, but I believe it is important to be transparent about what lies ahead. I can assure you that we will look at every available option to mitigate the human impact of budget cuts on our campus community. Finally, I want to address what can sometimes feel like an incongruent narrative that exists as we contemplate budget cuts at the same time that we have construction cranes busy all over campus helping to build Tykeson Hall, the Knight Campus, Hayward Field, and an addition to our student health center. The vast majority of construction projects and programmatic investments we are making across campus are the result of targeted donor gifts, specific state capital allocations, or auxiliary funding sources. 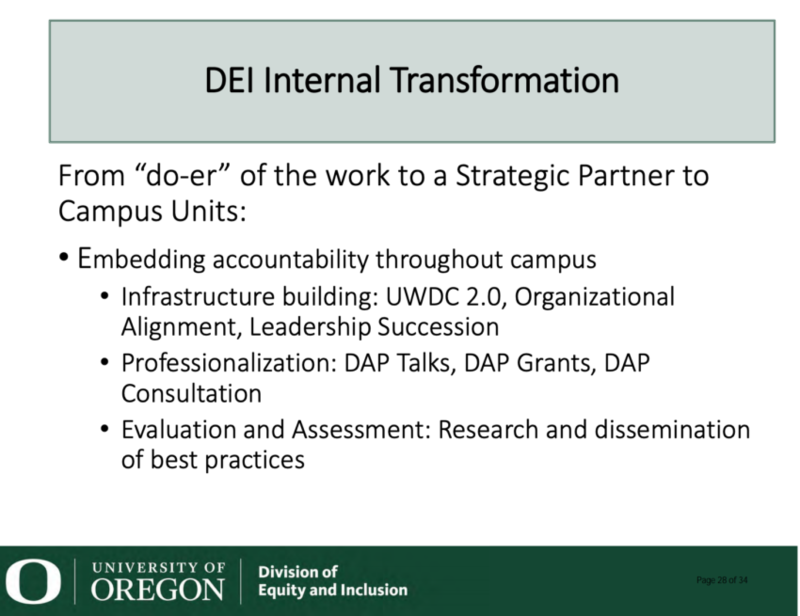 The reality is that these projects and investments—which generally involve little to no general fund dollars—are the very thing that will keep the UO on a path toward excellence even as we wrestle with the volatility of state funding and international enrollment. Thank you for your hard work and dedication to the UO. By working together, we will be able to weather the challenges that are ahead of us. 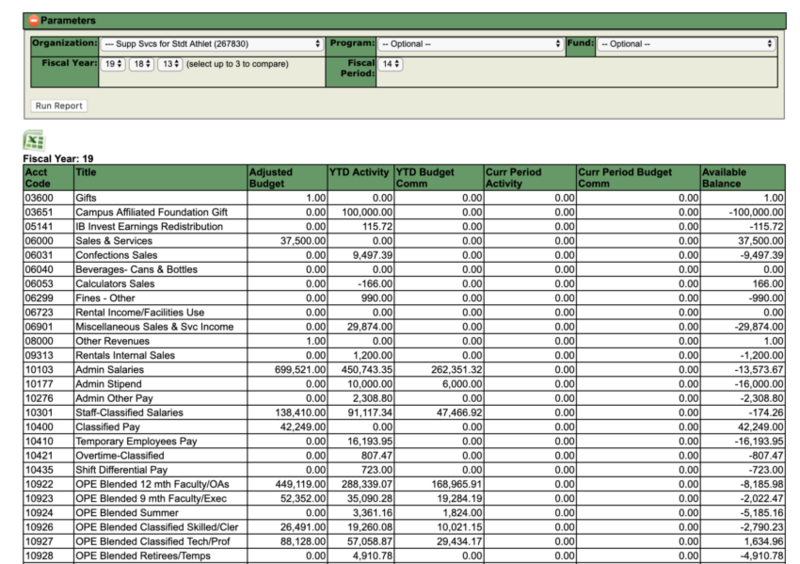 And for info on how much the academic side is subsidizing athletics, see here. 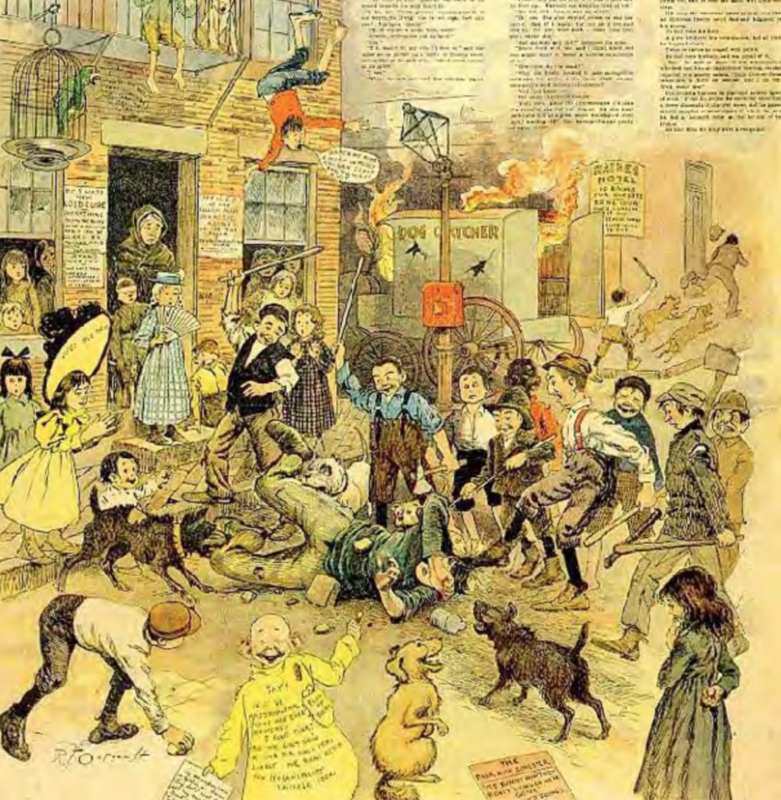 Community Member David Igl asks why there are still no interpretative materials posted at Deady Hall, and provides his usual claims that the 1920’s KKK was not, at its inception, a racist organization. I’ve responded to this before, at http://uomatters.com/2016/09/professor-frederick-dunn-was-not-tricked-into-joining-the-kkk.html. Calls for an advisory board to develop a holistic plan for UO tuition and growth. In an admirable first for the ASUO, rather than complain about the tuition increases, Gallegos proposes working with the administration and faculty and donors to increase scholarships, and with the legislature to increase state funding. Gallegos reports that as she meets with the legislature, she finds that even local legislators do not trust the UO administration or the board to make sure that any new state funding will actually go to students. The usual drivel from Harbaugh, who sold out to the administration for a few course releases and $10K here and there, about how we should all work together in harmony to improve UO. Apparently Roger Thompson reports that interest from prospective students is at an all time high. Sure. There will be cuts, about $10-$12M. 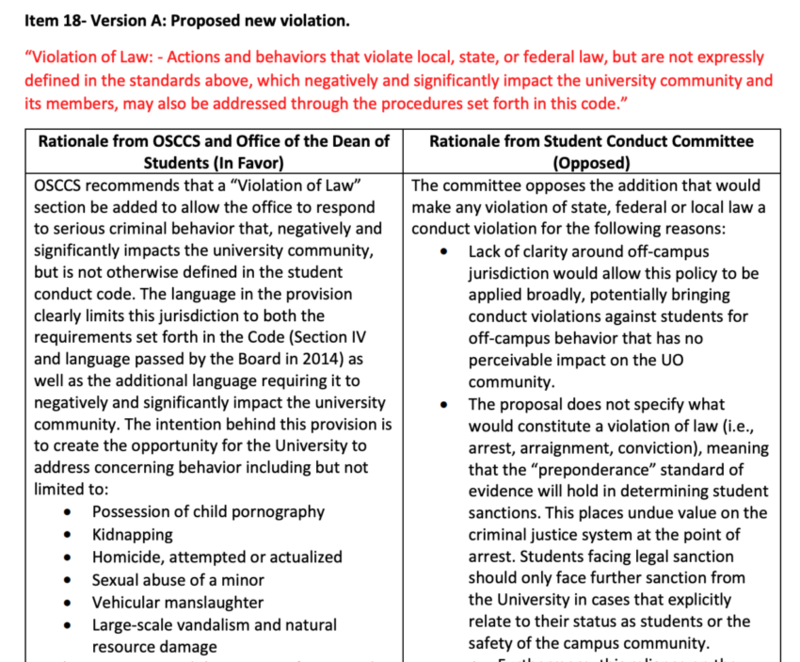 Pres Schill opposes legislation to disarm campus police. Making efforts to bolster humanities, using part of the $50M unrestricted gift he brought in. Knight Campus and cooperation with OHSU going well. Thanks the staff who worked to get UO through the snowstorm, keeping students fed and warm etc. … One of the major considerations by the board was public perception: The board settled on 2.97 percent to keep the advertised increase slightly below $1,000 per year so as not to deter potential new students, who are needed to increase the tuition-paying population. The proposal, which only impacts out-of-state undergraduate students, would increase the cost of a single credit by $22 next academic year. For a full-time student taking 15 credits a term, that shakes out to an increase of $990 a year, an increase slightly larger than last year’s 2.49 percent nonresident increase. Since I try to avoid meetings where the decision has already been made behind closed doors, I skipped this. But there appears to have been no discussion of price elasticities, discount rates, differential tuition, or what the point is in spending money on out-of-state marketing, branding, recruiters, and subsidizing Rob Mullens’s big-time athletic enterprise if our tuition setting process boils down to this. And since it apparently does, why not go to $999? That extra $9 would bring in about $90K, recurring – enough to pay for half a brander. The most recent estimate I’ve seen for the elasticity of demand for out-of-state students is 0.5. So increasing tuition 10% would decrease the number of students 5%, and increase revenue. But instead the university is going to give non-resident students a break, then come back and balance the budget by increasing in-state tuition. 7% increase for law school tuition, which still can’t balance its books, much less repay the ~$10M subsidy Jamie Moffitt gave to former dean Michael Moffitt. Board Chair Chuck Lillis – who has lost several ERISA lawsuits for raiding his companies’ retirement funds – gets in a dig in about how the state is making the students pay for PERS. For a more intelligent view of what’s going on with PERS and what to do about it, try here. Lots more on potential cuts, etc. Pres Schill will send out a memo this afternoon. Talk about salary/hiring freezes. I’ll post more on this later. Recess for Lunch: Estimated 12:30-1:30 p.m.
2/14/2019: The RG’s Ryan Thorburn has the Leavitt story here. Meanwhile UO is considering layoffs for underpaid NTTF. 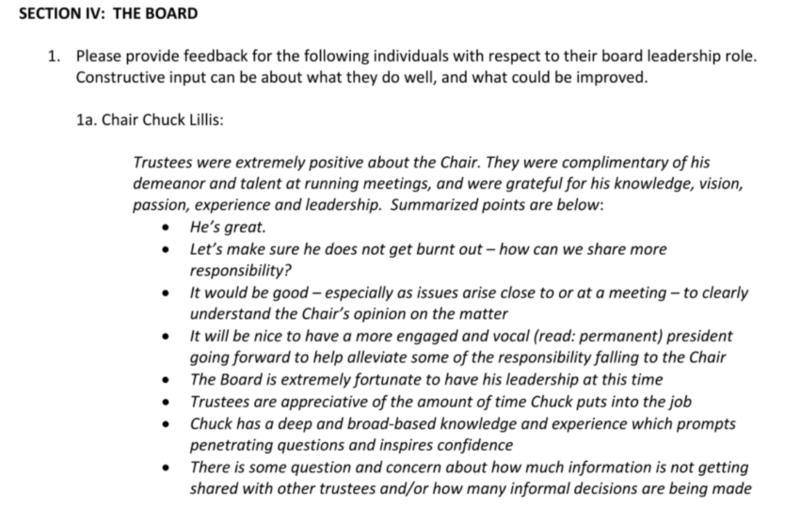 When I requested copies of these evaluations for our Board, I imagined I’d get some sort of substantial performance review, with input from stakeholders referencing the Board’s charge and its successes and failures on issues such as state funding, tuition increases, fundraising, finances, fiduciary oversight, etc. Public Meeting | March 4, 2019 @ 1:30 p.m.
No questions from the Trustees. Seriously. The members of the BOT Finance Committee have no questions about UO’s finances. Great. I’m thinking this is not going to be controversial, and it’s not. Approved. There’s a brief discussion with Cass Moseley about problems in Research and Sponsored Services. Pres Schill assures the committee he’s taking this seriously. We must have more zebrafish. $8M in NIH money. Action this day. Approved. Adjourn to secret Johnson Hall meeting about what to do about the GTFFers. The Trustees have moved their meetings from the Ford Alumni Center to the EMU Redwood room. Board Chair Chuck Lillis is absent, caught in a Denver snow storm. Public Meeting | March 4, 2019 @ 10:00 a.m. I missed most of it, but I’ve been assured by a generally reliable source that Provost Banavar delivered an excellent report. Cresko gives an excellent talk, w/out powerpoint! Ends on how to get UO’s undergrad programs in this area up to speed quickly. 2. 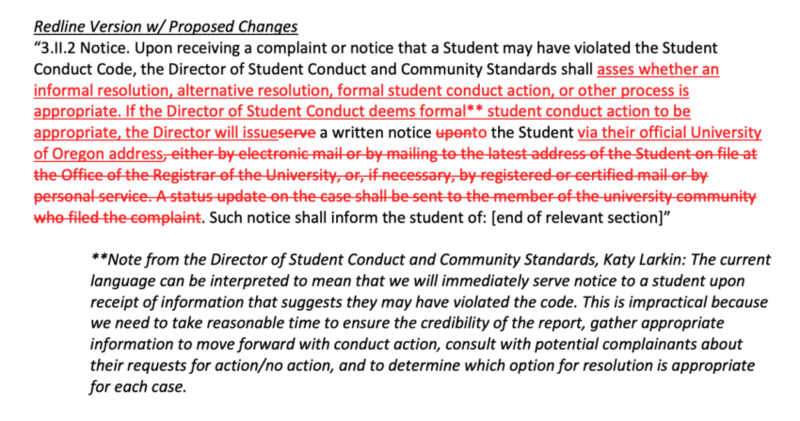 Student Conduct Code: Proposed Change and Update Regarding 2018 Changes (Action): Kris Winter, Associate Vice President and Dean of Students; Katy Larkin, Director of Student Conduct and Community Standards. I’m a bit confused as to why the committee is not discussing these at this meeting. They did vote to move the notice change to the BOT. 3. Diversity, Equity and Inclusion Initiatives and Updates: Yvette Alex-Assensoh, Vice President for Equity and Inclusion; Victoria DeRose, Associate Vice President and Director, Center on Diversity and Community; Leslie-Anne Pittard, Assistant Vice President for Campus and Community Engagement. Trustee McIntyre asks what the VPEI’s office does for socioeconomic diversity, and whether they have any assessment of their results there, or anywhere. The response is some anecdotes about campus engagement and “Diversity Action Talks”. They did a great job presenting this to the Senate las month, who approved it unanimously. The board committee is getting the 3 minute version. They’ll approve it and pass it on to the HECC. 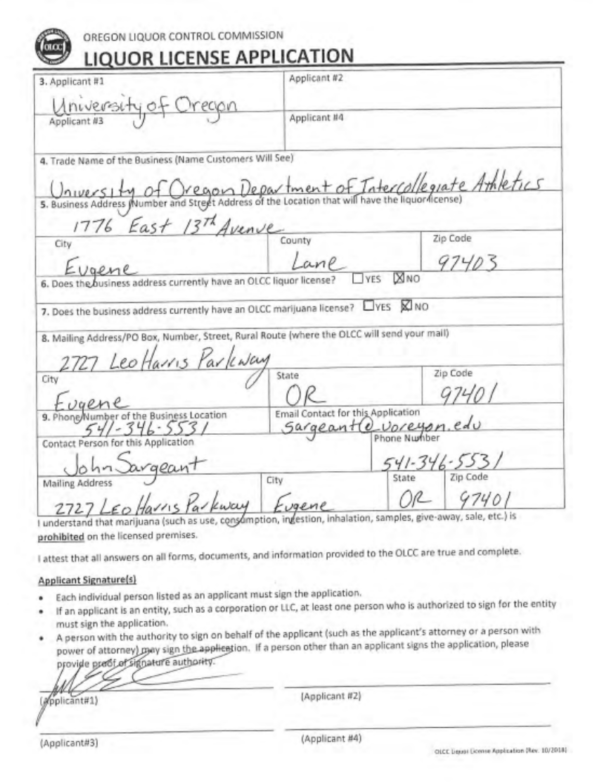 Back in 2013, under pressure from Phil Knight and other Duck boosters, the Oregon Legislature passed SB270, which allowed UO to set its own independent board. The hope was that, free from the shackles of state bureaucracy and control, and with a board of wealthy and politically well connected trustees, UO would thrive. Things have not worked out well. Tuition is up, undergrad enrollment is down, grad enrollment is flat, the board has failed to persuade the state to increase appropriations, and state support for capital expenditures has been modest except for Knight Campus and the IAAF Championships. 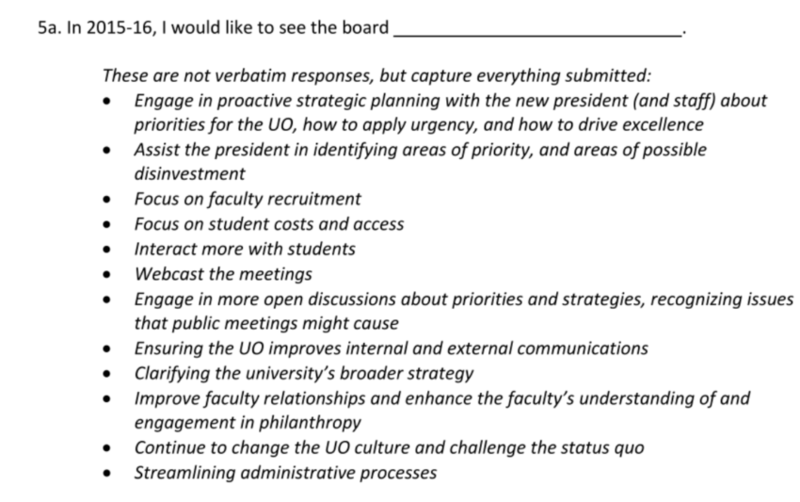 Nor has the Board been able to limit state micromanagement of the university’s academic decisions, e.g. with SB160 this year. Private philanthropy appears to have increased a little, although even with the Knight gift the $2B campaign fell short and had to be extended. In addition, the care and feeding of the Board eats up about $600K a year. The only items of substance on the agenda appear to be rubber-stamping decisions on out-of-state tuition, minor revisions to the Student Conduct Code, a new PhD program, and something about new Zebrafish facilities. And a secret meeting about the labor negotiations with the GTFF. Winter, Associate Vice President and Dean of Students; Katy Larkin, Director of Student Conduct and Community Standards. Equity and Inclusion; Victoria DeRose, Associate Vice President and Director, Center on Diversity and Community; Leslie-Anne Pittard, Assistant Vice President for Campus and Community Engagement. conducting deliberations regarding labor negotiations with the Graduate Teaching Fellows Federation. This session is closed to members of the public and the media. The meeting will be called to order and adjourned. No other topics or matters will occur on March 4. Notwithstanding the location listed above, this March 4 executive session will occur in Johnson Hall. How is UO Matters doing at providing information about UO? Comments may be deleted if your h-index is less than 20. Please use a screen name. 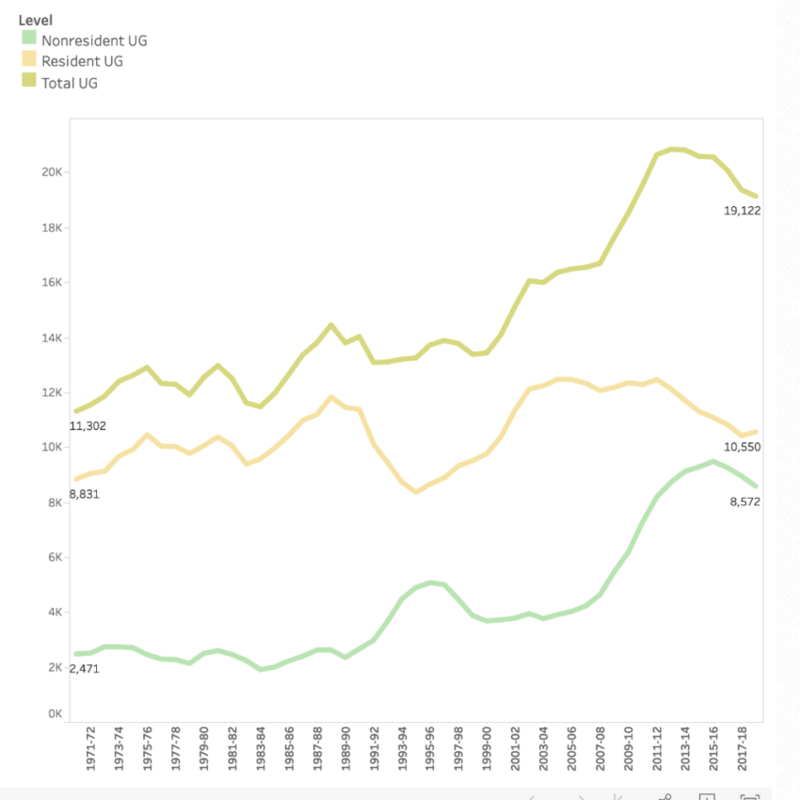 UO Matters is a news and opinion blog about the University of Oregon. It is published by Bill Harbaugh, and registered with the Oregon Secretary of State as an "Institutionalized News Media Organization" (sic). UO Matters | Powered by Mantra & WordPress.